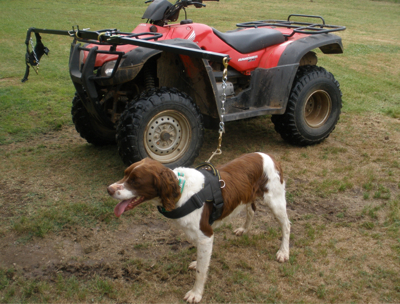 A Bird Hunter's Thoughts: Get Your Dog in Shape! He goes 10X farther than you! Get Your Dog in Shape! He goes 10X farther than you! Ace (B/M), ready to go! I highly encourage you to use some form of roading in your dog's conditioning. Off a bicycle, perhaps. I don't have the numbers, but I would be confident saying roading is more than double the benefit of letting your dog run free. My dogs really enjoy it, which is another mystery of life.